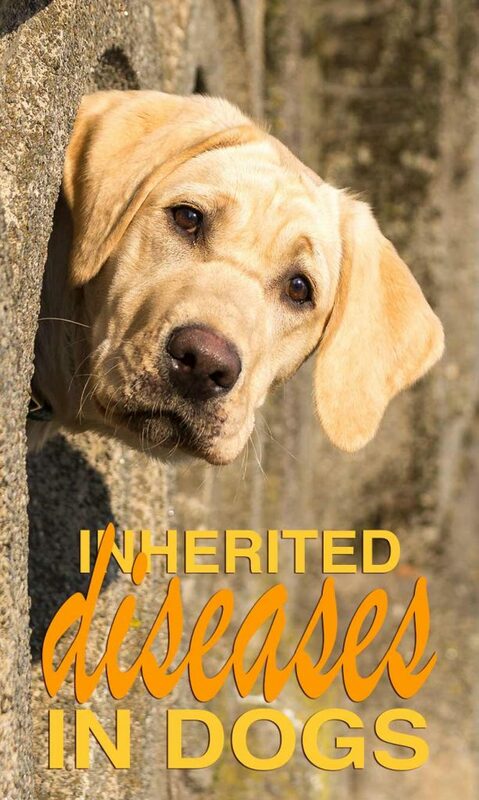 This section of the website provides information about inherited diseases in dogs. You’ll also find links to the various sections of this website that focus on specific health conditions in more detail. Just like people, dogs sometimes inherit some genetic information from their parents which can lead to ill health. Labradors are no exception. 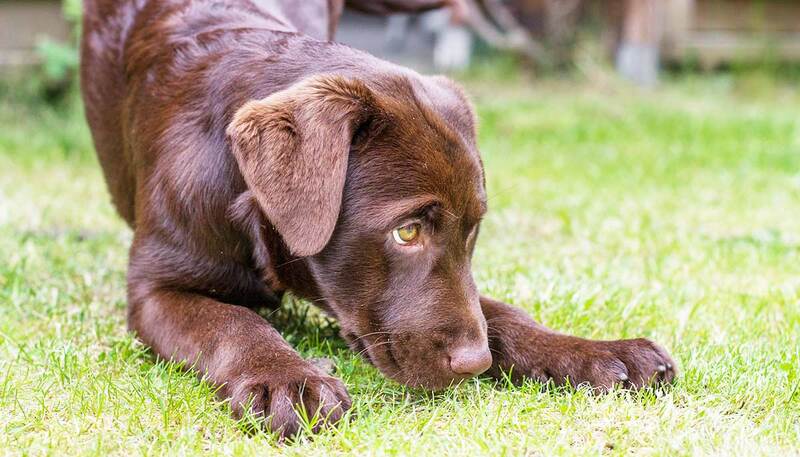 Fortunately a lot of effort and money has gone into researching inherited diseases in dogs and tests have now been developed which can help us keep our Labradors healthy. There are now some diseases which we can avoid entirely in our dogs by testing our breeding animals. The key to understanding how this influences the puppy’s health and other aspects of his development, is knowing that the dominant gene is a powerful ‘switch’. It turns off, or ‘over-rides’ the effect of the recessive gene. Diseases are often hidden in recessive genes and passed down through the generations without ever being expressed or causing trouble. If the dominant gene is present, the dog will still be healthy. The dominant gene switches off the nasty, disease causing, recessive gene which cannot then be expressed. Only a dog with two recessive genes – the third dog in that list above, can get the disease. What DNA tests do, is look at the genes that each dog possesses for the disease that is being investigated, and identifies which of those three categories above, that dog falls into. What can a dog DNA test tell us? As well as being used for providing information about our pet’s ancestry, dog DNA tests can also give us information about their genetic health. Check out Health screening for Labrador Diseases for more information on the tests now available. Some common inherited diseases in dogs cannot be detected through DNA tests. In some cases this is because a test is not yet available. In other cases it is because the mechanism of inheritance, the way that the disease is passed from parent to puppy, is complicated. Some dog genetic diseases are thought to be caused by a cluster of different genes (polygenic), or by a combination of genetic and environmental causes. Canine hip dysplasia falls into this category. Some of these more complex inherited diseases in Labradors and other dogs can be detected by physical examination. Assessing x-rays of joints for example, or looking at the interior of the dog’s eyes using special instruments. Scientists are always working to discover the rogue genes that cause health problems in our dogs. How do new inherited diseases in dogs appear? Purebred dog gene pools are constantly shrinking. This is because dogs die and many dogs are never bred from, and by definition, purebreeding prohibits the introduction of new genetic material. Many scientist believe this situation will need to be changed sooner rather than later. As gene pools shrink, the risk of two recessive genes being passed to a puppy, one from each of his parents, increases. This is because his parents are increasingly likely to be closely related. So while genetic testing is a wonderful thing for those of us that want to buy a puppy with the best chance of good health. It isn’t going to prevent the long term decline of health within a breed. You can find a full list of other related articles in our health articles category. Let us know if there are any health topics you would particularly like us to feature on the website. This article has been extensively revised and updated for 2017. We update the Labrador site regularly to bring you the latest Labrador health information. Hello I have a Golden lab who is 9 months old and intermittently has issues with the front and back leg at a time or both together going numb for a few days at a time. The thing is she limps but does not seem to be in pain and tempermant remains exited as ever. This can go weeks without a reoccurance and appears to be perfectly normal. What sorts of things could cause this. Vet appointment is booked already. Just curious. I have one golden Labrador aged 7years. She has swollen lymph glands in her back legs in last 2 years and its huge now. Local doctor try lots of madicine but nothing improve, now the only option to operate but doctor said if we operate to remove the glands another glands will be raised in body. What to do – confuse. Please suggest if any one has any solutions. My Lab Mac, 11 years old is suffering fom kidney problem.Is this problem is a common one? His Blood urea was 503 and creatinine was also too much high. He has left eating from past 20 days and constantly vomiting with dark yellow fluid 5-6 times a day. Nowdays he is on glucose via IV with lasyx in it. Can you recommend us medication or please suggest something for the same. Hello, I have a 10yr old chocolate lab who I adore as one of my own children!! Several years ago he had a tragic accident where his tail was skinned and went through 3 different surgeries to correct it. After that he began to have seizures, our local vet prescribed Zonisamide which has controled then very well. Now over the last week he refuses his favorite dog food, he too has fatty lumps on his sides, I’m becoming very concerned this may be a sign of a greater problem?? Waiting for vet, what can I do or expect? I adopted a Golden retriever mixed with Basset Hound. She looks just like the retriever but has the body of the Basset hound She was 3 months old when I got her and now she is 6 1/2 years old she was bleeding through her urine in December of 2014 taking her non stop to vets office I finally found a new vet this past June she was diagnosed as having transitional cell carcinoma (TCC). They ended up doing the surgery removing the large mass they gave her a few months to live.. She has her good and bad days! My reason for telling my story is so others can look for signs in their Labradors! My female Lab Retriever is 10yrs old in Oct, she is 37kg, is she over weight. Also she was diagnosed with a ‘fatty’ lump on her side 3 yrs ago, it is about the size of a tennis ball when she is standing, but flattens out when she is laying down. There are more lumps, one on her chest bone, & smaller ones on her side & upper leg. We have been told Labs are prone to these lumps, & leave alone, unless they are troublesome or get to big, is this true? my lab 15months old and she is pregnant..
Now days she get itching so much and rad patches she bites his leg and body and get it red. Hi, my golden lab was diagnosed with acute colitis at 18 months old. He is now 5 years old and has steroids daily to control the symptoms but now has steroid induced cushings. I have been trying to find more information about both of these but haven’t had much luck. Can you help? My 2 months old lab female its not eating anything .. getting vomiting watery and motion is fully brown with durty smell..so now my vet advice pedilite so n in motion there is worms also tel me what happened to my puppy. MY 3 MONTH OLD LAB IS LIMBING . 2 DAY AGO I PUT MY LEG ON HIS FRONT LEGS & FROM THAT DAY .HE IS LIMBING A LITTLE WHEN EVER HE USE TO RUN MORE OR JUMP HIGH,I HAVE CONSULTED MY VET & GIVING MEDICINE TO BRUNO AS PER HIS ADVICE,,WHETEHER I NEED TO CONSULT MY VET AGAIN …. Give your vet a ring Dev, and let him know of any changes. hi! my friend has an 8 months old chocolate lab, he just texted me that tip got bruises on his mouth and the hair on his mouth is depleting. what should we do? thank you! HI I have 6 month old black lab it has alot of tick on it I keep plucking it but it keeeps coming back pls help me. I have a 6 year old Choc. lab who was diagnosed with Exercise Induced Collapse (EIC) at 10 months. She also has an enlarged heart that was base lined with ultrasound. I am finding very little information about EIC here in the states (Maine, USA) and was wondering if you had any information you could share. Thank you for a great site and insight. I have also been giving him oral antibiotics since last Thursday when we first noticed the swollen glands, but so far, no improvement in the swelling. They are not tender to the touch and are sort of free floating, somwhat hard and firm. Hello there, Just found this site and have a question regarding my 7 year old Josh. Noticed swollen lymph glands in the back legs, under the jaw, and in the chest/shoulder area. He has really bad allergies and takes a Benadryl twice daily to combat the allergies. We are now in bad allergy season here in Canada, and I am wondering if it possible that the swollen glands might be because of the allergies. He has no other symptoms. Because of the huge amount of vet costs over the years, I have started treating him more naturally and have stopped visiting a vet for more than 2 years now. Our 5’year old chocolate has had allergies for 3 years now. A vet suggested Benedryl to us as well. Hugely expensive and it really didn’t work. Switched vets, put him on prednisone . There was an almost instant change. It has been three years ( the controlling doses are MUCH, smaller than the original ) and it really was like night and day. Hi Jayne, you need to get your vet to check your dog. Hi Kate and congratulations on your two boys. You will have your hands full for a while 🙂 You can find articles on chewing in the behaviour section and puppy behaviour articles in the puppies section, both links are in the menu at the top of the page. You might also enjoy the forums where there are a lot of puppy owners and plenty of experienced Labrador owners who support and advise one another. Finding forum answers and questions very interesting. Our boy pup is now almost six months old and has brought us much joy. My dog shadow can’t walk or sometimes can’t even pick up her head. We took her to the et she had x-rays and its not her hips or her back first back in October they gave her antibiotics and that didn’t work then in January they gave her steroids and that didn’t work someone help! She’s 7 months old. I have a 6 year old lab (female) , she is facing a lot of problems while walking , her hind leg gets cramped , can you please help me with a solution. tnx for your kind suggestion. My Daughter Has A Chocklate Brown Labador She Is Seven Month Old ,She Lives On A Island With A Lot Of Farmland .She Takes Her Dog For A Walk To The Shore And Has To Pass Through Common Grasing Land Where Cows Feed. Her Dogs Eats Cow Poo And Sheep Poo On The Way And Lots More ,Like Dead Birds . Will This Harm Her. Or Does She Need To Stop Her From Doing.This. Eating poo of other animals is not a great idea, partly because of the potential for ingesting parasites, and partly because we humans find it offensive!